Two Stage Air Compressors consist of two or more cylinders. The first stage, low pressure (LP) cylinder is always larger in diameter than the second stage, high pressure (HP) cylinder. The atmospheric Air enters into LP Cylinders through inlet filter & valves and passes to HP cylinder through intercooler and HP inlet valves. The Air is for higher pressure by HP cylinder and then delivered to final destination. The highly efficient intercooler provides maximum heat dissipation between stages, resulting in more Air per horse power and less trouble from carbonization. 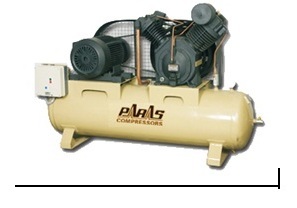 Economically priced, Paras Compressor Two Stage Value Packaged Air Compressors are perfect for automative, commercial of light industrial applications where a dependable Air supply is required. The value package includes the added features of a mounted and wired starter; automatic start / stop pressure switch control with suitable size receiver tank. Celebrated Safety Week Workshop conducted for all the workers on how to be safe and secure in work environment. A wide choice of accessories and spare parts is available for reciprocating compressors. The accessories are specially selected or developed for use with our compressors and their quality and functionality in combination with the compressor is tested in the Paras Compressor. The spare parts are identical to the original compressor parts which assure the best possible performance and lifetime for the compressor and parts. Over Hung construction, fitted with ball bearing, replacement Crank pin bush made from special steel material the crank shaft is balanced. One piece solid and construction, no adjustment required, integral splash lubrication. Special graded cast iron material, heat of compressor dissipates through other side deep radial fins, precision bored and honed for smooth running. Pistons are made from Aluminum / Cast Iron material, each has compressor rings and oil control rings for high efficiency, minimum wear. Finned copper tubing dissipates heat six times faster than bulk cast iron, more efficient use less power. Specially designed valves-key to long life, high quality steel material, easy for removal and servicing, large flow area with longer life and better performance.